Ace of Seafood - Soundtrack Edition on the Playism Store | Bringing a different breed of indie game to the world. Fish and crustaceans fight great wars, shooting deadly rays of light at each other. Do whatever it takes to become the Ace of Seafood. 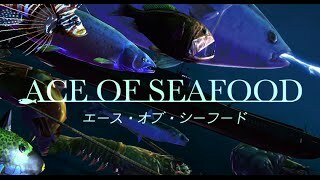 Game + Soundtrack for Ace of Seafood. 15% off when you buy this set! Nussoft is an indie circle individually managed by the Japanese programmer Nusso. He works on programming games, mostly by himself, at night or on his days off. He sometimes appears at Japanese indie game exhibitions, and has released a game called “NEO AQUARIUM - King of Crustaceans -“ while attending the School of Design at Kyushu University. The sound is provided by DEKU, who worked on the BGM for Suguri at Orange Juice. His philosophy is that if a game he envisioned does not yet exist, he should try to make it.